Anthony Pilkington came off the bench to stab home a 93rd-minute equaliser to rescue a point for Wigan Athletic in a four-goal thriller at Bristol City. Latics had enjoyed the best of an entertaining first half, and could and perhaps should have led by more than just the single goal. The on-loan Chelsea right-back won the ball on halfway, and advanced through the midfield before pulling the trigger from 30 yards, with the ball swerving into the top corner of the net. Nick Powell steered a cross-shot just in front of the stretching Josh Windass and against the far post before the break, and the visitors continued to look the better side until the hour mark. Then, City boss Lee Johnson made a triple substitution that changed the whole complexion of the game. Within six minutes, Niclas Eliasson - one of the new-boys - crossed from the right for Matty Taylor to get in between Cedric Kipre and Chey Dunkley to head past Christian Walton. Then, on 69 minutes, Taylor teed up another of the changes, Kasey Palmer, to lash into the roof of Walton's net. City then had chances to put the game to bed but failed to take them. And Latics made a triple change of their own with 10 minutes to go that saw them restore parity in the nick of time. 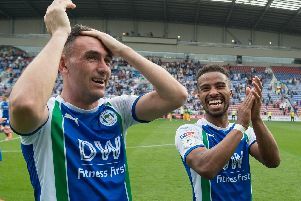 With three of the five added minutes having been played, substitute Leon Clarke had a shot parried out into the path of fellow replacement Pilkington, who found the net to the delight of the 490 away fans behind the goal. The late drama sees Latics climb to sixth-bottom of the Championship, although the gap to the drop zone has been cut to just two points. But the overall performance will have given huge cause for optimism for the remaining six games. As promised, Paul Cook tweaked the formation in an attempt to end the wretched form on the road. With Michael Jacobs out for the season and Gavin Massey dropping to the bench, in came Windass up top and Kipre to a new-look back five. And it was another centre-back, Dunkley, who really should have put Latics ahead with their first attack. James floated over a wicked free-kick, and Dunkley looked a certain scorer as he slid in at the far post, only to direct his effort wide. At the other end, a Jay Da Silva volley required a fingertip save by Walton at the expense of a corner. And moments later, Bailey Wright headed inches wide from Jamie Paterson's cross. Latics were looking dangerous every time they went forward, and they took the lead eight minutes before the break through the individual brilliance of James. The City custodian was then a helpless bystander as Powell hit the woodwork just before the break. Latics picked up where they left off after the restart, with Garner heading just over from Nathan Byrne's deep cross. That was the cue for City to go all in and make a trip change before the hour mark. And the move reaped immediate dividends, with City finding themselves in front in the space of 11 minutes. First, Eliasson crossed from the right for Taylor to head home past Walton. Then it was Taylor's turn to tee up Palmer, who fired past the exposed goalkeeper to the delight of the home supporters. It was all City at this point, with Latics trying desperately to stem the bleeding - to no avail. Wright sliced the ball wide from a great shooting position, before Famara Diedhiou again got in between Dunkley and Kipre but couldn't hit the target. Latics boss Cook opted to follow the lead of his counterpart in sending on all three subs with eight minutes to go, with Garner, Kipre and Windass making way. But City remained on top and, after a mix-up in the Latics box involving Dunkley and Walton, the visitors were relieved to see Palmer blaze high over the top. Five minutes of added time gave Latics hope of pinching something that their overall display had undoubtedly merited. And there was to be one final sting in the tale as Clarke was denied on the line, only for Pilkington to pip Byrne to the loose ball and steer it home.